As we all know that there are many UI changes when compared to AX 2009 and 2012. Many new features or areas are added in all forms. 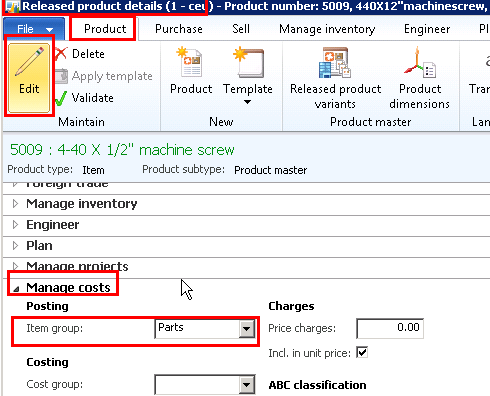 I took this opportunity to explain all the feature or part or areas names in the AX 2012 forms. Below is the screenshot for your reference. You can find its related names in directed TEXT boxes. As per other AX consultants demand I am posting the Ledger integration or Finance or GL posting impact with respect to Purchase order and Sales order process. 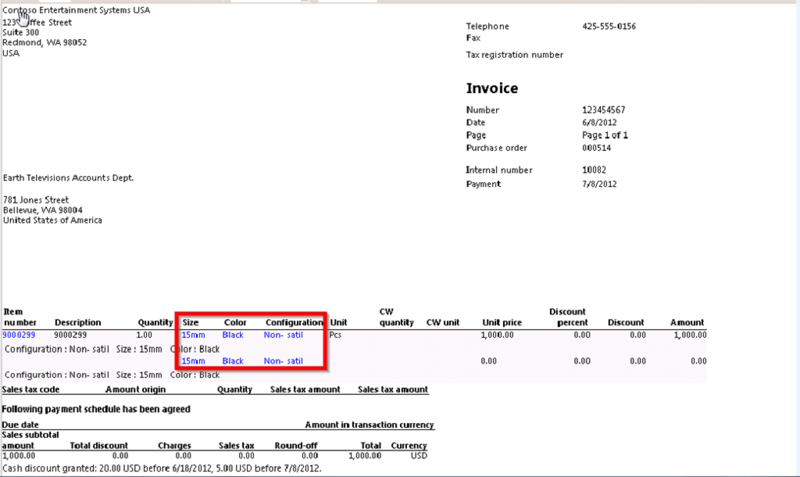 In Item group form –> click Purchase order fast tab as shown in below screenshot. Once you click Fast tab purchase order it expands and shows account type options. It has all accounts type which will be effected during Purchase order posting process and its related Main account fields. we need to select all related ledger accounts in the Main accounts field. How to assign Item group to Item or Product. This is the way how Inventory management integrates with Finance module or GL. 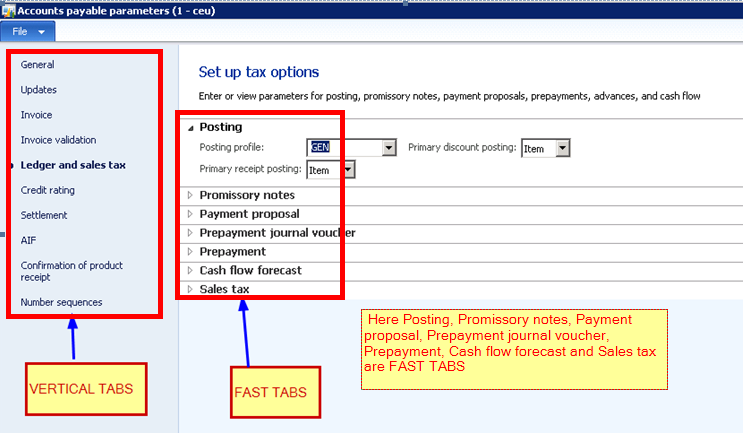 Go to Accounts payable –> Common—> Purchase orders—> All purchase orders—> Select Invoiced purchase orders—> Double click on the purchaser order number –> Purchase order form opened –> click Invoice Horizontal tab –> Journal group –> Invoice action icon –> Invoice journal is opened –> click Voucher action –> Voucher transaction form is opened –> view the ledger account column which were effected. This concept holds same for Sales order process, Inventory journals and production order process. We are going to discuss about the process as how to modify the Sales or Purchase trade agreements which are posted. Here we are going to discuss how to modify the line discount highlighted in the below screenshot which is already created and posted. For example there are chances the management suggests to change or modify the trade agreements which were posted already by mistake. 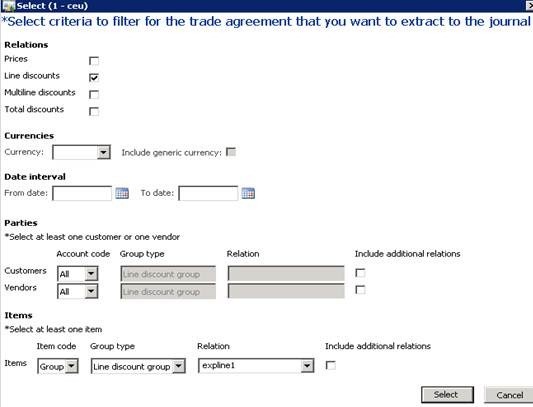 The below screenshot displays the existing and posted Line discount trade agreement for the item discount group ‘expline1’. · Navigate to Item discount Group (Sales and Marketing à Setup à Price/Discount à Item Discount Groups) and select ‘expline1’ Discount group. · Click on ‘Trade agreements’ button and select ‘Create Trade agreements’ as shown in the below screenshot. · A new trade agreement journal is opened with an empty Header. · Select a Journal Name from the drop down and click on ‘Lines’ button. · In the Journal Lines form, do not create a new line as we are not creating a new trade agreement. · To fetch the Line discount select the line click on ‘Select’ button. Please refer to the below screenshot. o Parties, in the account code select table if you want to select for a particular customer and select ‘Group’ to select a customer discount group and select all for all customers. Same applies for vendors also. 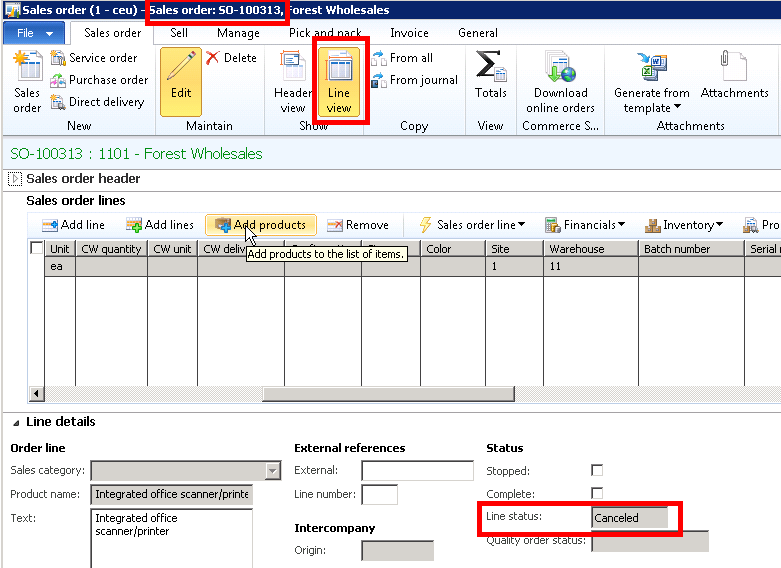 o Uncheck ‘Include additional relations’ check box as it will fetch all the lines for other relation. o In the Items field group, select item code as ‘Group’ as we are going to modify a line discount for an Item discount group. o Select the relation field as ‘expline1’ from the drop down. o Click on select button. · All the lines are fetched in the Journal Lines form as per the selection we made in the select form as shown in the below screenshot. · In the lines that were fetched, identify the line you intend to modify. · In our case, first line is the line which we wanted to modify. · In the line make the changes that you want to do, we can change all the fields except for the relation field. · In our case we are changing the Amount in currency field. Change the value from 15 to 25 as shown in the below screenshot. · After changing the required fields, click on ‘Post’ button. we are going to discuss about how to cancel a sales or Purchase order. 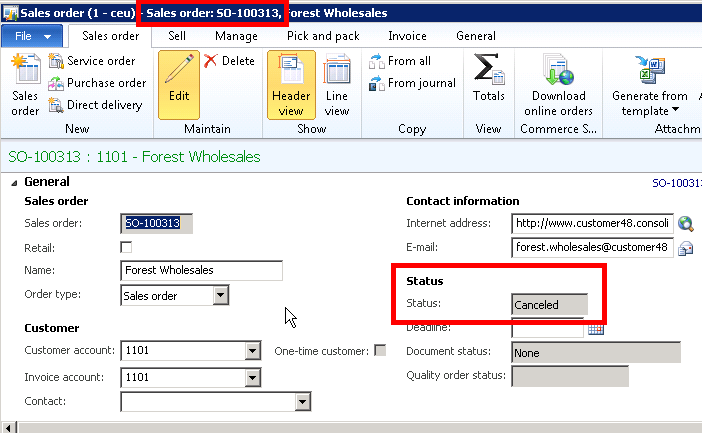 If a Sales order or Purchase order gets a Cancelled status if it is cancelled in below way. Here let us take example of Sales order cancellation process and same process holds for Purchase order also. First create a new sales order and have one sales line for example. New Update remainging quantity form is opened—> Click Cancel quantity button as shown in below screenshot. once you perform this for a single line where no items are not delivered then automatically sales line status will be changed to Cancelled as shown in below screenshot. Once you perform this for all lines which are not processed (means no items were delivered from all the lines) then automatically sales order header status will be changed to Cancelled as shown in below screenshot. Now we are going to discuss about how to print Backorder items in the Invoice report. You all know Backorder lines are nothing but Items which are not delivered or not packing slip updated in a given sales order. AX provides information to Client and Customer regarding Information of undelivered Items in Packing slip and Invoice reports for a given sales order. 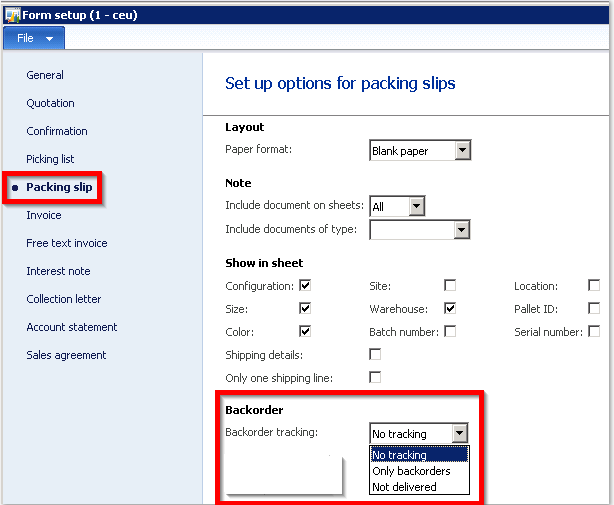 NO tracking: If this option is selected in a packing slip, AX doesn’t print any backorder line items in the report. Below is screenshot for your reference. 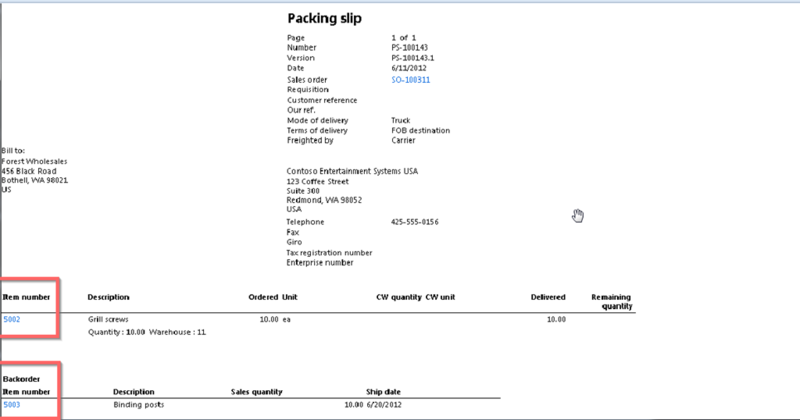 Only backorders: If selected AX prints only backorders lines in the sales order Packing slip report as shown in below screenshot..
Not delivered: If selected, AX prints physical updated (Packing slip posted) and Undelivered or Not delivered items in the packing slip copy as shown in below screenshot. The same functionality holds for Sales order Invoice as well. Here we are going to discuss about the steps to be followed in order to display the Inventory dimensions in sales orders reports like sales confirmation, Picking list, Packing slip and Invoice reports. Upon functional requirements there is necessity for any organization to print or display Inventory dimension on the sales orders reports. To facilitate this AX 2012 has given some setups in Form setup and these are explained below. Accounts Receivable –> Setup –> Forms –>Forms setup. Check boxes shown in red color box highlighted are to be selected based on requirement. 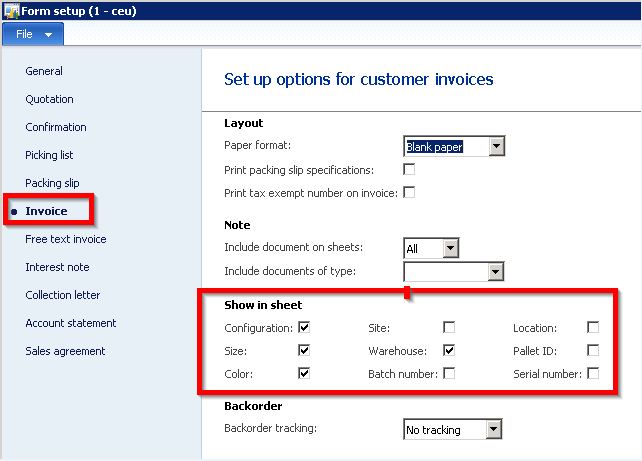 Based on selection of checkboxes it displays related dimension values in the Invoice. The same process is applicable to all other reports like Quotation, Confirmation, Picking list, Packing slip and Invoice. 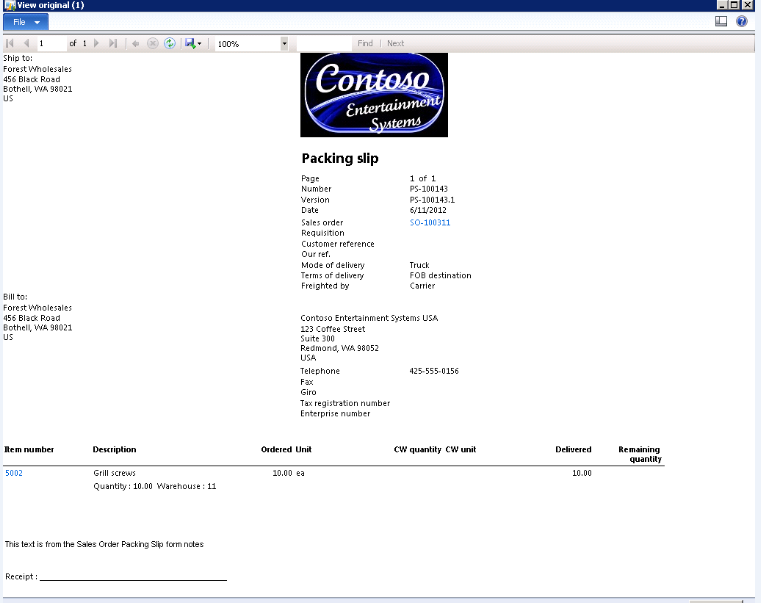 Below you can find one copy of Invoice with configuration, Size and Color. The same process is also applies to Purchase order reports like Purchase order Confirmation, Receipt list, Packing slip or GRN and Invoice. Accounts payable—>Setup –> Forms –> Forms setup –> select related report. 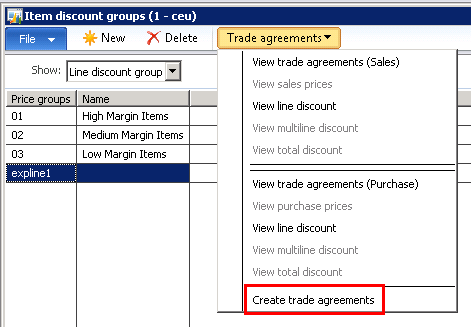 Item or Product Dimension groups differences between in MS Dynamics AX 2009 and 2012. Now we are going to discuss briefly about changes or differences of Dimension groups with respect to MS Dynamics AX 2009 and 2012. First main difference between Item dimensions in AX 2009 is called as Product dimensions. Now we are going to discuss about Counting journal which is part of Inventory journals. This is a process where we adjust Item’s On-hand as per the actual physical stock by posting a journal as per actual physical stock available in the warehouse. The Counting journal lets you calculate the current on-hand inventory level that is recorded for a group of items, and then post the actual physical count to make the adjustments necessary to reconcile their differences. 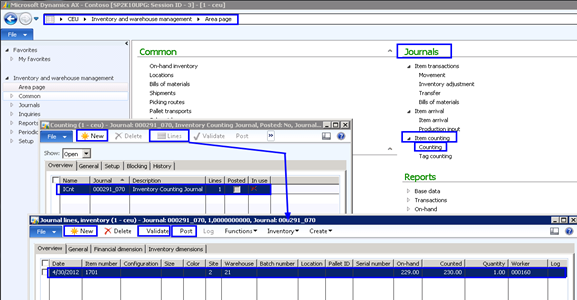 In Dynamics AX, you will register the counted quantity in inventory journals. When posting the inventory journal, the difference between the counted quantity and the physical quantity available in Dynamics Ax will post as an item issue or receipt similar to an inventory profit/loss journal. · A new dimension form is opened, with only Storage and Tracking dimensions check boxes enabled. · Select the journal name in the Name field for which you are running the counting. · Click Lines option as shown in the above screenshot. · By clicking Create in the Counting journal lines form, you can select one of the three methods of creating lines. This is shown in the below screenshot and following table. Selecting this creates a journal listing only for those items for which on-hand inventory is registered—that is, on hand inventory is not equal to zero. Selecting this creates a journal listing for all items, and through the counting process, warehouse staff will identify those that are on-hand (by noting the number Counted) or not on-hand (zero). Selecting this creates a journal listing only for those items with an expired batch date. 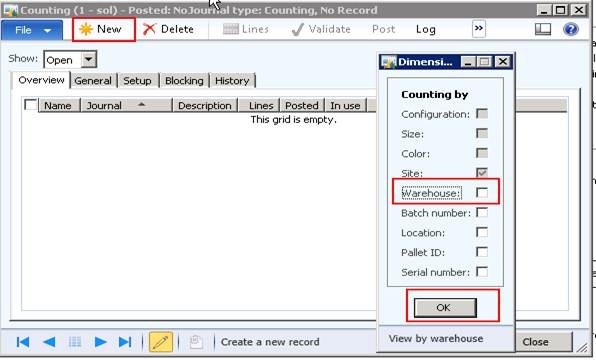 This enables warehouse staff to count only those items with expired batches so that these items can be removed from inventory or otherwise treated in a special manner. · You can also enter new lines by clicking Ctrl+L and enter Item in the item field. · In the Counted field, enter the actual physical quantity of items counted. · The difference between the on-hand inventory and the counted quantity is calculated automatically and appears in the Quantity field. Notice that you must enter a quantity, even if the quantity is zero, for every line that appears in the counting journal. · Enter any additional lines for items that were not generated when you created the counting journal lines. · Click Post to post any differences in system counted and physically counted quantity. Most of the modules names in MS Dynamics AX 2009 either changed or promoted into two modules with new names. some modules are completely removed and clubbed into other modules. these are explained in detail in below table. This Module is split into three and can be accessed from Home, Human resources and Production Control Modules. · Time and Attendance – Human resources. · Manufacturing execution – Production control. Here we are going to discuss how to adjust inventory i.e. 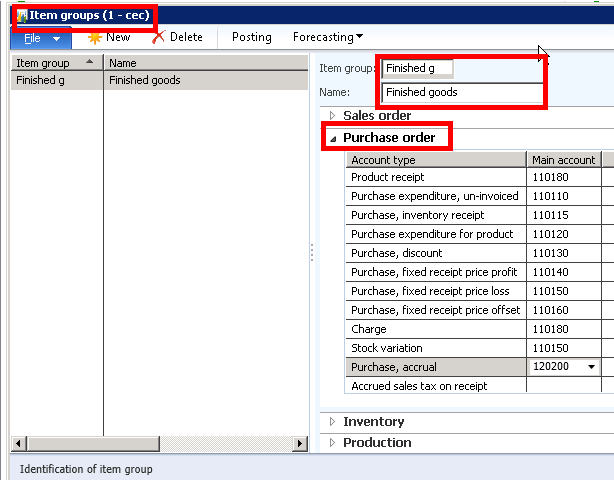 write off (decrease or removing) and how to increase or build up inventory in MS Dynamics AX 2012. This is common in day to day transactions to alter the stocks or inventory. 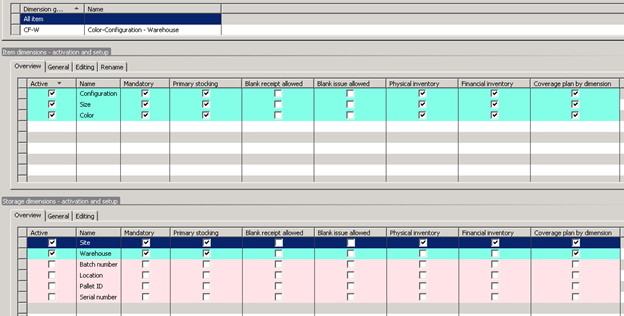 To address this we have Inventory journals in AX 2012. We can perform adjustment of item from above journals and these are explained in detail in my blog “ramdynamicsax”.